Considering I'm writing up this blog just over a month after this day, which I consider my day after more than a thousand days, says a lot about my lack of efficiency. Indeed, I'm nowhere near as efficient as my circumstances require me to be. Writing a daily blog as I had been doing in May/June made me conscious of time-management, improved the flow of words emanating from my daily experiences and somewhat lessened the prevailing alienation between personal and public. I have since boycotted Pakistan (I don't intend on travelling to or accepting Pakistan 's existence unless certain ground changes take place) and have retreated to Kashmir. This day was effectively my day as the Lahore High Court (Rawalpindi Bench) finally instructed the apprehension and detainment of the wily fox 'Bashir.' As a befitting bonus, I took delivery of my car after 9 months of incapacitation. A combination of previous mechanical machinations and financial limitations had deprived me for so long. I felt somewhat proud that my stance of zero tolerance for corruption was finally vindicated. Bashir was now in jail, totally against convention. I had not spent a single rupee towards his apprehension whilst refraining from employing a lawyer to advocate my case. Bashir, on the other hand, had spent plenty on feeding the police to stall and limit criminal proceedings against him, whilst employing a renowned criminal lawyer to argue his case. The judge was kind enough to allow me to address the court audience and amplify the example of what a citizen shouldn't be, a la Bashir. On leaving the court, I received many a congratulation and support for my 'performance' accompanied by words of caution as to the unpredictability of events in Pakistan. I think I'll leave it there at this stage, the euphoria is rushing back. Despite all, I'm extremely determined in my mission. I've been working all night, hoping to bring my dossier on Bashir up-to-date online. My night involved smoking copious amounts of Pine Menthol cigarettes and drinking plenty of mineral water. My brain was slow and jaded, yet my determination, as always, took me through to the morning. Frequent power cuts throughout the night were taken on the chin each time. My uncle had insisted that I employ a lawyer, so that he may navigate us through the legal minefields that lay before us. That led to me meeting Mr. Younus Bhatti last night, a seasoned lawyer with Supreme Court experience and important victories to his credit. Further to his credit is his stance on the lawyer's issue. He's boycotting the court today as are all lawyers who seek an independent judiciary. Bashir's lawyer; Ilyas Siddiqui is true to form, in court today. Defending members of the Pakistani 'Mafioso' would hardly incline you towards positive change. Avarice has found many partners throughout history. The Rawalpindi Bench of the Lahore High Court, is situated on a scenic hill at the Southern entrance to Rawalpindi. The 8;00 am air and serenity play their part in injecting some life into my ragged soul. The foxy Bashir is nowhere to be seen in the court-room and when the court usher announces Bashir vs. the State, a sheepish looking Bashir (akin to a disobedient child dreading punishment) meekily enters the court-room. He is literally cajoled by his lawyer to approach the dock. The so-called public prosecutor enquires as to whether I have a lawyer present, I explain that today is a strike and in any case; as a matter of principle, it's the state's responsibility to represent itself in a criminal case. "Don't worry, I'm here," he assured. We both gave each other a quizzical look before he asked whether I could come to a compromise on payment. I explained that I couldn't as there was now too much water under the bridge. Subsequently, a nod and a wink between the judge, Sajjaad Ali Shah and Bashir's lawyer was followed by the judge announcing that Bashir had 15 more days to arrange payment. Before he even hit the hammer, Bashir was out in a flash. I quickly composed myself and sternly said to the judge, "May I address the court please?" Before he could answer me, I handed him the letter that I've addressed to the criminal justice system of Pakistan, summarising the current context of Bashir in relation to the judiciary. He took a not so detailed look before handing the letter back to me and suggesting that I deposit it in some unspecified office. "What a cretin." I thought to myself. Instead of putting Bashir behind bars for habitually flouting the law, he'd given him reprieve! Bashir's lawyer made an attempt to explain the judges decision, at which I snapped, "I don't recall seeking counsel from you." That somewhat dampened his euphoric demeanour. I grudgingly retreated back to the public gallery a la Inzamaam and listened intently to subsequent proceedings. Lo and behold, a young man whose relative had a 50,000 rupees cheque dishonoured, was promptly sent to jail in lieu of his relative, with some verbal bashing from the Judge to boot! This was too much for me. At the recess, I decided to make an outburst in court, targetting the investigating officer Mr. Gulzar of Waris Khan Police Station. "This is too much humiliation for me to take....I'm a principled beast in a country stinking of corruption....Do me a favour, just shoot me and end my story, else I shall wreak havoc on the corrupted!" "Why don't you shoot yourself?" Mr. Gulzar helplessly retorted. "I cannot commit suicide, it's haraam (forbidden in Islamic law)...I'm making a point....Killing me and others like me is the only way you might prolong this 60 year-old fiasco!" I ended. I asked the judge's assistant to give me instructions on how to object to today's proceedings. This led me to the registrar's office via an extremely irritating clerk, who was hell bent on extracting some money out of me on some pretext or another. He obviously didn't know me, "It ain't happened in 3 years and it ain't gonna happen now mister!" Do you now understand why you have zero credibility amongst the comity of nations in the world?" I insisted. Changing the subject, he suggested that I should pay some Pathan about 10 lakh rupees and get Bashir kidnapped! "That's how low and ineffective you consider your justice system to be, not to mention your stereo-typical perceptions about your Pathan brethren? You should be ashamed of yourself...Next stop, the Supreme Court for me." I concluded. Driving back from court, I was now feeling sick, physically as well as mentally. The taxi-driver happened to hail from Muzaffarabad and as we passed countless photos of 'Justice Choudary', he marvelled at the respect that the bona fide chief justice had earnt amongst the nation. This is the apex point of recognition and respect, he thought. The taxi driver had inspiring words for me too, "You're so fortunate that you do a job that encourages positive change in society, Being a principled writer and unflinching from the truth makes you very rare and worthy of envy". Those words were more than enough to negate the horrific morning and put the tired 'beast' to sleep. Continuing with my indulgence over the net, it does occur to me that I must catch up on my reading. I've been a profuse reader on current affairs and history, particularly so since entering the field of journalism in 2001: that has taken a back-seat of late. There is just so much commotion; in my mind, between politicians, amongst lawyers, within intelligence circles, from the media and anybody else in this country who has more than 2 'pennies' to rub together. That precludes most people in this country, not that they matter....or do they? The actions of the majority 'with' suggests that those 'without' don't have a prayer. Prices of essentials have rocketed so high that many 'normal' people, dare not venture out of their homes; empty pockets and hot weather can be a lethal if not fatal mixture. Can the 'Lawyer's Movement', embodied by the call to re-instate Chief Justice Iftikhar Choudary, bring justice to that 'normal' man or woman? That man who, if his blood brother were to be killed, would have to perform 'miracles' just to ensure that his local police would register a case. That woman who, if she were raped, would have to share her 'soul' with many before judicial action was even contemplated. The Pakistani people have a tendency to veer towards emotion, stretching out for that crest of a wave. However, every silver lining has thus far, not lived up to it's promise. Be it, the 1965 war with India, winning the cricket world cup in 1992 or going nuclear in 1998. 1965 was followed by the 1971 debacle over East Pakistan; political/economic/cultural neglection and imposition got it's reprieve in the shape of Bangladesh. 1992 was followed by Bangalore 1996, where the key component of the 1992 victory and stalwart of 21 years, Javed Miandad was forced to field on the boundary in his last appearance, huffing and puffing out any chance of him avoiding a run-out later in the evening and thus, denying Pakistan a fair chance of victory. 1998's jubilation on becoming the first Muslim country to go nuclear was followed by the humiliation of 2001's "Do you wanna go back to the Stone Age", (I'm paraphrasing a certain American official's alleged threat to Musharraf that year). Is the lawyer's movement yet another machiavellian manoeuvre conjured up by idle minds or is it a genuine, sustained effort littered with sacrifice and drive to give the 'normal' Pakistani easily accessible, transparent justice? I must confess, the events since March of last year have consistently surprised me. I do wish, for the sake of Pakistan as well as the world that the latter proves true. On that day when Chief Justice Iftikhar Choudary sat amongst those four rabid generals; what would have gone through his mind? "Why don't I just oblige these guys and do what every chief justice before me has done? I'm alone here, who'd support me if I didn't oblige? What would happen to my family if the threats I'm being confronted with were to ensue? He deserves massive credit for standing up and being counted. Persisting with the 'tricky' issue of missing persons, used as fodder by the agencies in the 'War on Terror', insistence on the steel mill issue and taking up cases for the downtrodden, the nation owes him kudos. 'Justice Choudary' as some now fondly refer to him, has stepped on many a powerful toe, Pakistani as well as foreign. Let's hope against hope and hope that this lawyer's movement, at the very least, mitigates the established tendency of Pakistan's glorious moments to provoke a mightier misery. The Pakistani public is desperately in search of relief: From Musharraf, from a pliant judiciary, from the American government's political and military influence, for crying out loud. Today isn't a lazy day. Since Friday evening, all my waking hours have been devoted to the net. Today is no different. The fact that I haven't been able to do any external lobbying (meeting relevant people/institutions to lobby my 4 points) does bug me incessantly. I eventually do manage to climb out of my 'hole' and first stop is the notorious Waris Khan police station. I need to pick up some documents relating to the High Court hearing of Bashir vs. the State on Tuesday. The investigating officer has been phoning me repeatedly, requesting that I pick up my notice. I have decided to slightly alter my strategy and not abdicate from the judicial system, despicable and downright unjust that it is. By boycotting at this stage, I may well miss a trick or two. That could possibly give Bashir some reprieve and I'm in no charitable mood. At the police station, I engage in my diatribe against the system in front of about a dozen police officers. Using the example of how they've coddled Bashir these past few months, I try my utmost to get them to say something in defence of this system. Decades of being adherent cogs of a highly corrupt machinery had made them almost morally and ethically immune. Unsurprisingly, they didn't have much hope that the lawyers' movement could bring positive change. These bread and butter agents of the system were too set in their ways, I've repeatedly concluded. I went to sleep at about 8:30am. I was so engaged with my work and the tortoise-like speed of the net constantly failed to match the speed at which my brain was working. I did intend to re-start my strategy of interviewing political, bureaucratic and media personnel but alas, the priority of ordering my data and emboldening my web presence dictated my mood and activity today. An example of how aloof I am from the outside world hit me hard today. I overheard a conversation that Mohammed Asif (The promising yet precocious cricketer/fast bowler of Pakistan) had been arrested at Dubai Airport for possession of marijuana. Thinking it was news, I relayed the 'newsflash' to a friend over the phone, only to be told that the story was a week old. Someone mentioned that marijuana and Pakistani cricket go hand in hand....Remember Wasim and Waqar in the West Indies? It helps them to focus and concentrate, I'm instructively told. Living close to the edge is another characteristic I find familiar to the Pakistani psyche. I'm staying in a house whose residents once lived extremely comfortably, a period of not earning or investing prudently has brought them to the verge of destitution. However, the attitude remains cavalier and oblivious of fast-changing dynamics of society. High food prices here in Pakistan compare unfavourably even to some countries in the West, the people here are struggling to adapt, yet it hasn't changed their approach....not yet. Relaxing for 2 or 3 days doesn't help when you need to get back to work. Eventually, when you do finally manage to pluck up the requisite amount of determination and will-power, a flurry of ideas and 'things to do' bombard your mind. For a single individual working on his own initiative and without clear cut resolutions in sight, it's not a pleasant state of mind to be in. My predicament necessitates heavy opportunity cost when alloting time to activities that I've deemed imperative. What or who suffers? My family, my health, my wealth (though I don't have much to speak of), my friends and all those mundane or perhaps not so mundane activities that the modern man/woman has become accustomed to. For example, I don't watch TV or read newspapers, hardly ever socialise or engage in recreation. In fact, I could probably count on one hand how many times I've laughed out loud, in these past 3 years. When I eventually arrive in Rawalpindi, I plunge into the net, my passion and source of hope and solace. I'm almost 5 days behind in my daily blog and there are innumerable other net issues that require my attention. When in Rawalpindi or Islamabad, my financial predicament and safety concerns dictate that I shouldn't reside at one fixed location. Unfortunately, I burden friends that I've made in my time here, by imposing my presence upon them. Over the years, this has provided me with tremendous insight into the miserable plight of the average Pakistani citizen. I salute their courage for enduring lack of opportunity, scarcity of justice, exorbitant prices of essential goods and environmental holocaust; amongst the many other ills that pervade this society. While I'm busy typing or clicking as I navigate the web, I'm forced by my hosts to engage in a conversation over the political machinations that dog this country and hold its citizens hostage. The restoration of Judges and the "Long March" planned for the 12th of June from Multan (Southern Punjab) to the Capital, feature prominently in our discussion. One opinion on which we unanimously agree: There is probably no country in the world that supports the implementation of an independent judiciary in Pakistan. Most countries and large corporations in the world are happy dealing with a political mafia at the expense of the citizens of Pakistan. Though I should be up and ready to return to the cauldron of Rawalpindi and Islamabad, my guilt of not spending adequate time with my family forces me to re-think my priorities. Yes, my Naani's issue and Bashir's (The Wily Fox) issue do dominate my attention and time-horizon, though I do qualify that by linking both issues to wider concerns of public interest in the region. Nevertheless, creating balance between work and home is something that I've abysmally lacked at times. Making amends is the order of the day, so commands my wife. Every aspect of one's life is interlinked I contend, neglecting one important aspect affects all others. If you were to look at the condition of my house, you would know exactly what I'm talking about. I've never been much of a 'domestic hand' and my water tank would testify to that. Spending time at home also helps me re-evaluate my strategy. Questions like, "How do I make myself more effective with the 'powers that be' in Islamabad and New Delhi? For how much longer can I financially sustain myself, not having worked for the last 3 and so years? For how much longer will my family persevere with the frugality that I've imposed on them?" Being virtually cut-off from the world isn't necessarily blissful after all. Later in the evening, I phone the AC's assistant to find out if he's been able to prise out our file from the ISI yet....sadly not..."Hopefully by Monday", he apologetically informs me. Taking my Naani through the long route i.e Gurutta to Lahore by car (c.350 kilometres) > Flying to Delhi and then to Jammu > Jammu to Mendhar by car (c.200 kilometres) is now perhaps my only realistic hope, despite my Naani having a vulnerable heart. Time is running out and taking her the 60 or so kilometres across the LOC could take another year at this rate. Urvashi Butalia is a renowned writer in Delhi, who has done much laudable work on displaced families and is thankfully taking great interest in our case. She could I feel, make this family re-unification happen. I call her to find out how she's progressing. Urvashi in turn informs me that she'll be meeting the former deputy High Commissioner of India in Islamabad, who is now based in Delhi, on Monday. People do ask and wonder as to why I've spent the last 3 and so years in a country like Pakistan, from where most 'sane' people flee at the earliest opportunity. My answer is and always will be my 'Naani'. Born in a Hindu-Brahman-Saasan family in Nikyaal, which is c.35 kilometres west of the district capital Kotli and merely a few kilometres from the LOC). She was barely 15 when she was displaced from her family, who were fleeing for their lives on account of belonging to the 'wrong' religion. India or more precisely "Indian-administered Kashmir" was to be their enforced refuge. For all the shortcomings of my 'Naana' (maternal grandfather) who has been the major stumbling block in allowing me to re-unite my Naani with her family, he deserves credit for 'picking her up' and protecting her from almost certain dishonour and death at the hands of marauding hordes of men, who were baying for the blood of Hindus. He brought her home to Gurutta, married her and that's where she's been ever since. It'll be 61 years this October. My attachment to her is even more important when you consider that my mother was very young when she got married (13 or 14 perhaps). I being the first-born child, my Naani took the responsibility of nurturing me through those 4 difficult years that I spent between Gurutta and Kokoi (my father's home across the road) before I came to England in 1976. It wasn't until late 1987 that I 'returned home' for the first time and it was during this visit that I learnt of my Naani's background and origin. Please read my last piece for the BBC which narrates this story in further detail. Yes, I've been trying to re-unite her with her family since. This may give you some indication of the torment that I've endured and reasoning behind my deciding to 'stay put' here. Even if I was offered the 'throne' of the United Kingdom, I would not have returned there. I must add here that the Indian Government has 'hit me where it hurts most' by continously refusing to issue me with a visa since April 2005. Amongst the very few plus points of staying here in Pakistan has been that I've been in close proximity to my Naani. Accompanied by my little daughter - Maghrib - spending time with her and listening to her wisdom and lamentations on life, often reminds me of the famous Jagjit and Chitra song, "Wo Kaghaz ki Kashti" (That paper boat). Life in the village is conveniently slower than in the city and this suits me just fine at the moment. Being able to put aside my self-imposed duties and spending quality time with those closest to me in Kashmir is the closest I suppose, I could get to heaven on earth. I decide that I'm going to burn the midnight oil tonight. I'm behind in my daily blog as some of you would have noticed. More importantly, I'm one average man striving to make an impact on a multitude of objectives. I get scant help from anywhere and it's not just down to lack of affordability. People here are frightened of involving themselves in anything that may affect the status quo. They've resigned themselves to stifling their creativity and emotions. It's not until 4:30 in the morning that I finally decide to quit the net cafe, with about 95% of what I wanted to do on the net still outstanding. It's raining 'cats and dogs' as I make my way to 'Pir Wadai' (the public transport station where I'll catch my wagon to Kotli, my home district in Pakistani-administered Kashmir). Each time I visit Kashmir, I never fail to be mesmerised by it's lush greenery, open spaces and intoxicating air. The fact that this rapidly degrading environmental haven has acute political disabilities is never lost on me, as I've been constantly reminded of this sad, emaciating fact every day for the past 1,141 days. I'm at the Assistant Commissioner's (AC) office by 9:00 am (nice and early). There are plenty of querying looks from the sea of lawyers, legal assistants, clerks, local government officials and members of the public, as I focus my camera over them. At one point, a burly policeman approaches me and in a tone incommensurate to his size, politely asks about my origin and why I'm here before ushering me to the correct quarters. The AC's assistant is willing to give all the necessary information that I seek - off the record - and agrees to my suggestion that I should obtain an interview from the AC, which I duly do. - From October 1947 to April 2005, the Ceasefire Line (renamed Line of Control in 1972) dividing Kashmir between India and Pakistan prevented 'legal' movement of people across the divide. - As part of the "Peace Process" inititiated between India and Pakistan in January 2004, it was mutually decided to start a bus service between the two capitals viz. Muzzafarabad (Pakistani-administered Kashmir - PAK) and Srinagar (Indian-administered Kashmir - IAK) in April 2005. - The devastating earthquake in October 2005, hurried both countries into opening up 4 other crossing points along the LOC. - Policy-making remains with Islamabad and New Delhi, though they both maintain that implementation rests solely with the administrations in Muzzafarabad and Srinagar i.e. that the Indians and Pakistanis do not interfere in the implementation process. 1) Eight attested photos and application forms to be submitted to your district administrative office. 2) The local office of 'the' Intelligence Agency will make various checks including, visiting your home or asking you to come to a local office. 3) The forms return to district administration office. 4) They are then sent to the capital administrative office in Muzaffarabad. 5) They in turn send the forms over the LOC to the other capital administrative office viz. 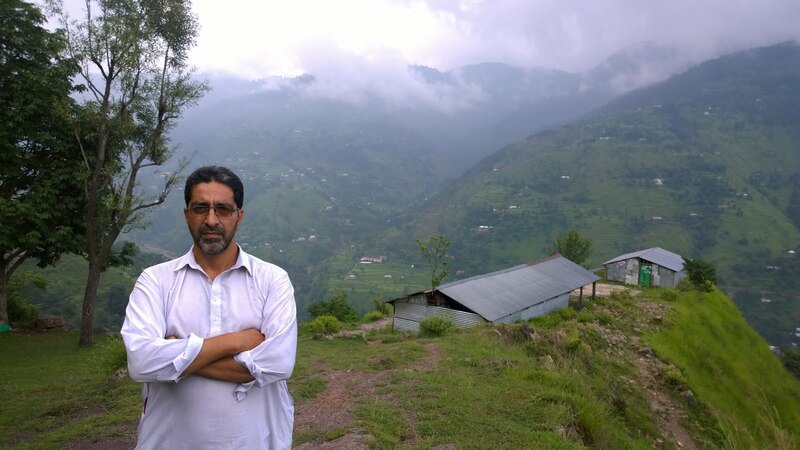 from Muzzafarabad to Srinagar. 6) The forms are then passed to the district administrative office of where your relatives are. 7) Then they are passed on to 'the' Intelligence Agency who do their 'checks'. 8) The forms are then returned to the district administrative office (where your relatives reside). 9) They return the form/s to the capital administrative office (Srinagar). 10) They in turn pass them back across the LOC to your capital administrative office (Muzaffarabad). 11) Who return the accepted forms to your district office, who finally give you the 'green signal'. n.b. This whole process is repeated each time you apply! - Cross-LOC movement has been sporadic, frequently interrupted and only 2 crossing points have a regular fortnightly service, namely Muzaffarabad-Srinagar and Poonch-Rawalakot. - The application process is so tedious and inconsistent that some people have had their applications processed within a month while others have waited for two and a half years, indeed some are still waiting. Meanwhile, some people have even travelled 2 or 3 times since April 2005. - The Intelligence agencies on both sides dominate the process and are the major reason for delay. This negates the notion that Islamabad and New Delhi do not interfere in the implementation process. - The rest of the delay can be attributed to local government administrations, who process applications in a part-time capacity. I understand that there are no dedicated staff on either side and that their budgets are limited, with one official lamenting on the inability to even purchase essential stationary! - Movement is restricted to those who have blood relatives and even then government servants are ineligible to apply. You are also restricted from what you can take across (cited in an earlier blog). - Most movement has been of refugees from either side, old people longing to meet their loved ones and are mainly Muslims. Unfortunately, the Hindus and Sikhs who live on the Indian side, justifiably have reservations about re-visiting their ancestral homes from where they were forcibly evicted in 1947 (More about this in future blogs). - There is apparently no public record on the amount of cross-LOC movement, though this district office (Kotli) asserts that hundreds of thousands of people want to cross. To my utter horror yet little surprise, I learn that our Cross-LOC application made on the 25th of March viz. for my maternal grandparents and I, is still sitting with the local office of the ISI! It has been more than two days since I last visited a media outlet and that wasn't particularly productive either. On my agenda today is interviewing Ahmed Zaidan (Bureau Chief of Al Jazeera -Global TV Network Islamabad) and Imtiaz Gul (Bureau Chief of SAMAA - Urdu affiliate of CNBC - Islamabad). However, first stop of the morning is to the Pakistani Foreign Office, the very institution which was responsible for instigating my 6 day detention at Adiala jail in January. Let's see if they'll be instrumental in putting an actual criminal behind bars for a change i.e 'The Wily Fox' Bashir. Basically, I need them to verify and stamp the Power of Attorney paper that my uncle had given me way back in November 2006. This is on top of the verification that the High Commission of Pakistan in London has already done. Whether or not the 'Bashir' issue will be resolved through legal means is beyond being a 'moot point' but I feel it necessary to cover all loopholes that may arise in any case. This is also an opportunity for me to vent my frustrations with an organ of the 'State'. I do wonder at times, "Do these government institutions have any idea of how much misery and suffering of millions of people has been caused by their lackadaisical approach over the past 60 years?" While the foreign office official tries earnestly to explain that the situation cannot get better overnight, (a standard and oft-repeated piece of rhetoric) news breaks out that a bomb has exploded outside the Danish embassy in Islamabad, causing a serious amount of fatalities. Our conversation ends with the official expressing his wish that if only there were more people like me in this society and that he must prepare for Yasin Malik's (JKLF chief in Indian-Administered Kashmir) meeting with the Foreign Minister, due within the next 15 minutes. "Sympathy doesn't alter reality though," I hurriedly exclaimed. My thoughts return to the terror attack on the Danish embassy as I head towards the External Publicity Wing (EPW) of the Ministry of Information, which amongst other tasks, monitors foreign media references to Pakistan. It is beyond argument that this country has a negative image across the world. I would describe it as the manufacturing hub of global terror. It's myopic and 'faithful partnership' with America over the past 7 years has heaped misery on millions, who are forever determined to not only destroy what remains of the fabric of Pakistan but to teach America such a lesson that history will be obliged to never forget. As a country, if you have no credible institutional framework to address people's grievances; where the idea of justice is mere fantasy; in a country where the masses are economically and ideologically vulnerable and where the political steering wheel is firmly in the hands of the Americans, do terror acts like today's come as a shock? As a muslim, what disturbs me most is that in Pakistan; If I were looking to commit an 'act of terror', there are limitless opportunites and resources available for me to perpetuate the negative perceptions that many non-muslims have about muslims. On the other hand, my quest for peace, freedom of movement and socio-economic progress has fallen on deaf ears thus far. That's precisely why I'm aiming to fill a gaping void in mainstream media. "We appreciate what you're doing, we wish the youth of this country were like you, isn't mainstream media helping you? There's not much we can offer you in terms of assistance, no you can't record our interviews - we are public servants". Despite the above, visiting these government institutions isn't bereft of purpose. Each representative has given me practical advice within their limitations and there is no doubt that they will raise my concerns with their superiors. Visiting the 2 media outlets mentioned at the beginning of today's blog is now out of the question as their focus is glued to the Danish embassy. Such is the modus operandi of modern day media; the 'what' and 'how' narrative drowning out the 'why'. This gives me some time to spend with someone who knows Bashir from childhood. He is adamant that I refrain from publishing what he is about to tell me. His explanation is that, although Bashir has cheated many people within his family and others in the 'local market', exposing him would disturb the societal equilibrium and cause un-needed and possibly fatal problems for him and his family. Aah...Bashir can now also be described as a terrorist! The previous evening's social setting triggered many a thought about the apparent dichotomy between spiritual endeavour and working for positive change in society. There's plenty of historical precedent to suggest that synchronising the two can bear immense political fruit, I dare say that Mohandas Karamchand Gandhi proved as much. Indeed, a prominent feature of advice given to me in this region has been to equip myself spiritually, indicating that while I displayed great energy and drive, endurance and creative vision, a particular void in my character/personality; needed to be filled. What does irk me at times though is when people totally disown the world and engage in full-time or all-out spirituality. I would describe that as a state of denial, even apathy, lack of courage and tack in tackling injustice, even downright disrespect to one's own faculties bestowed by the Almighty. The Indian sub-continent has a rich heritage of sages, sufis and sadhus of course. I'm enamoured by those who had socio-economic and political relevance and who contextualised their advice based on the 'need of the hour', as opposed to those who preached worldy disassociation. Soothing and at times intellectually stimulating though such discussions can be, the reality of 'tangibles' has to be addressed. Every single day I feel that I'm starting from scratch, I have to pick myself up, expend yet more time, money and effort on issues that are either easily avoidable or non-existent in that part of the world where I've spent most of my life, namely 'The West'. Temperamental electricity; hordes of flying insects that still find my skin and blood as succulent as ever despite 3 years and almost 2 months of acclimatisation: In the hope of saving a few rupees of a budget with an uncertain future, means having to hang on the back on passenger vehicles with ten's of kilos of luggage whilst consuming hazardous fumes coming from all directions; jostling with fellow passengers and at times being exposed to their obnoxious under-arm odour (and vice versa); stifling heat, passing open sewers and garbage dumps, dead animals rotting on the 'sidewalk'.........where does it end? When will I make a breakthrough? Of far greater importance and perspective; for how much longer will the people of Pakistan have to pay for the sins of the power elite? Most of today is spent on the world-wide web, that great untamable and thus far, benign information monster; which is giving the common citizen of the world much more than what most of their respective governments have given them viz. freedom, opportunity and hope. I was scheduled to meet a certain Mr. Nazir Geelani this evening (no relation to the Pakistani PM) who originates from the Vale of Kashmir, lives in Britain, is I understand active on the Kashmiri freedom struggle scene, was evicted from 'Azad Kashmir' by the ISI (Inter-Services Intelligence) last year and is currently in Pakistan, presumably busy lobbying for 'the cause'. There does appear to be plenty of underground dialogue taking place at the moment between the various political stakeholders concerning Kashmir. I'm not privy to much, thus meeting him could've proved insightful. Nevertheless, he didn't return my call so I'll presume he's got 'too much on his plate'. So have I actually, if I come to think of it. It's just that my plate is full of rock hard stones, accompanied by barely edible yet over-priced flour or rice - mercifully I have a choice - to be watered down the throat with my least intolerable poison. Talking in metaphors on a Sunday should be a given. Today was a lazy day, tomorrow is the resumption of the working day and for me should be a busy day. Whether it will prove to be a fruitful day is....not within my power. Isn't that the point where and why spirituality is invoked? I've not slept at all, about 10 million issues are racing through my mind. I had made an appointment last night with Mr. Hanif Abbassi (a politician who toppled Sheikh Rasheed - Musharraf's dubious former information minister - in the constituency adjoining that of our sad symbol of Pakistan Mr.Bashir). Unfortunately, I couldn't make it on time and had to endure a ticking off from the potentially venerable Mr. Abbassi. "Best to leave it for another day", he angrily suggested. An opportunity delayed rather than an opportunity lost I hope. Visiting a police station in Pakistan is hardly ever a pleasant experience. Since the creation of this country, they've acted as 'terror cells' facilitating political and economic expediency. In the process, many a poor and vulnerable Pakistani has felt the harsh 'arm of the law' and bowed to whatever has been demanded from him or her. In my three years here, I've made a point of not participating in what I can only describe as all-encompassing, rampant and over-flowing corruption. I can proudly announce that I've not given or taken a single rupee to promote, indulge or instigate corruption. I may not be able to influence the mind-set or habits of these pitiable people but I can as 'sure as hell' refrain from participation. Coming back to the topic of police stations and PS Waris Khan Rawalpindi in particular. As that is where the FIR (First Information Report) against Mr. Bashir and his fraudulent cheque was lodged on the 1st of May. It took the police 22 days to bring the issue to the Session Court Rawalpindi and that only after Bashir had been granted bail before arrest. It also took the police more than 6 weeks from the date of offence to writing the FIR. Having absconded from court the following day, just before the announcement of his bail rejection and then suddenly providing a bail slip from the High Court, after a week of disappearance does make me livid. I can almost understand the limitations of the police force. They are horrendously underpaid, undertrained and work in conditions which make them constantly susceptible to the darker side of human nature. Having said that, I cannot afford the same level of empathy to the judiciary. Their pivotal role in society makes it intolerable for citizens to have to endure transgressions on their part. For a criminal judge to judge criminally is gross criminality. In any case, the concerned investigating officer was not at the police station at the time, the SHO (Station House Officer) had been transferred while the original investigating officer had just returned from suspension. It was he who I met and his attitude was so deplorable that I decided not to prolong my stay. The impulsive thought in my mind is that of outright boycott. I did pursue and persist with the prevailing legal structure in all my time here. This is perhaps the time to state, "Enough is enough, how much more affront does one have to confront?" The rest of the day appears dark and hollow, lack of sleep is affecting me too. It does make me wonder about the conditions which convince human beings to become destructive. I will never contemplate that, I know I've cut through the threshold of physical and mental pain. Nevertheless, extending the boycott to money that comes into this country sounds like a promising strategy. After all, people abroad of 'Azad Kashmiri' origin are probably the most significant contributors of foreign currency into this economy. Anyway.....let's leave that for another day. I'm shattered. I was privy to an intriguing yet almost believable narrative last night. Apparently, President Musharraf has made a flailing lunge at instigating martial law, in a last ditch attempt to 'turn the tide', only to be outwitted by his recommendee and successor as chief of army staff (COAS) General Kayani. The 'operation' is thought to have revolved around the president issuing orders to an 'elite force' over and above the COAS! I do believe he needs one 'final kick', to accompany all the pushing and shoving that has been going on for the past so many months. I'll confess here that I 'kept faith in him' or rather persisted in giving him 'the benefit of the doubt', when most others had 'long washed their hands off him'. That was until one dark day in January, when I abruptly found myself amongst a sea of convicts at Adiala Jail -Rawalpindi (The Pakistani capital's version of Tihar in Delhi). Meanwhile, back to my primary mission: Taking my Naani (maternal grandmother) across the LOC (Line of Control - dividing Kashmir). I had an engrossing telephonic chat with the deputy Indian High Commissioner in Islamabad today. He maintained that Delhi had no say over the issuing of cross LOC permits and he agreed on my suggestion that I should track and pursue our application between the main district offices on either side of Kashmir viz. Muzaffarabad and Srinagar. It would be a gross understatement to describe my mood as terribly anxious. A period of 61 years is too long to be separated from your siblings. It may or may not come as a surprise to my readers that there are immense administrative problems associated with cross LOC travel i.e cumbersome and multiple form filling, applications routed through a multitude of bureaucratic and 'intelligence' loops on both sides of the divide. Add to that, the 'years' it takes for most applications to be processed. When the 'green signal' finally appears, travellers are severely restricted in terms of what they can take across. Letters, cassettes and electronic equipment; "Don't you dare even think about it". What particularly irks me is that; to date no Indian or Pakistani media outlet has given serious coverage to this issue. It futher re-inforces my impression that the 'Kashmiris' are an awfully marginalised community. Plenty more on this topic to follow in due course, of course. A key component of my daily routine will be to visit as many media outlets as possible. The aim: to highlight my four areas of focus - please refer to my first blog - and look for an appropriate medium to synchronise my efforts with. An hour's worth of airtime a day on Radio or TV would be pretty apt. My first visit was to an Urdu daily newspaper 'ASAAS' (loosely translated as foundation or base), prominently located on the Murree Road (Rawalpindi's main thoroughfare and link to the capital Islamabad). It turns out be a fruitless exercise. After half an hour of thumb-twiddling I'm blithely informed by an assistant that, "The Chief Editor is not around, try tomorrow morning". I probably will not bother. While I'm winding down in the evening and reminiscing over my February visit to Jammu, I decide to give Rekha Chowdary (Head of Political Science at Jammu University) a call. "Rekha....Would you like to come to this side of Kashmir and accompany my grandmother and I across the LOC, so that she can finally meet her brother and sister after close on 61 years?" She replied in the affirmative and inferred that she would love to be part of what could prove to be an instrumental CBM (Confidence Building Measure - A set of actions that India and Pakistan agreed on more than four years ago, amongst the more notable being people to people contact). Pity I haven't benefitted much thus far! Rekha did lament over the arduous application process though and didn't think this could all happen in a hurry. Well, let's see if my activity over the next week has a greater impact than the last three years.